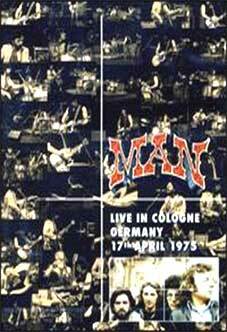 MAN - Live in Cologne, Germany, 17th April 1975 1. 7171-551 2. Hard Way to Die 3. C'mon 4. Someone Is Calling 5. A Hard Way to Live 6. Many Are Called But Few Get Up When this live in the studio performance was taped for German television Martin Ace had only been back in the band for just over two weeks. His recall to the ranks of Man was due to the sudden departure of the previous bassist in Man, Ken Whaley who departed just before the end of the American tour. The set was pretty much as it had been for the American tour and included the long time Man staples C�mon, Many Are Called But Few Get Up and Romain alongside some newer material such as Hard Way To Die which had appeared on the bands most recent album Slow Motion and the song Someone Is Calling which had surfaced during the sessions for Slow Motion but unfortunately due to the restrictions of vinyl was omitted from the final running order.